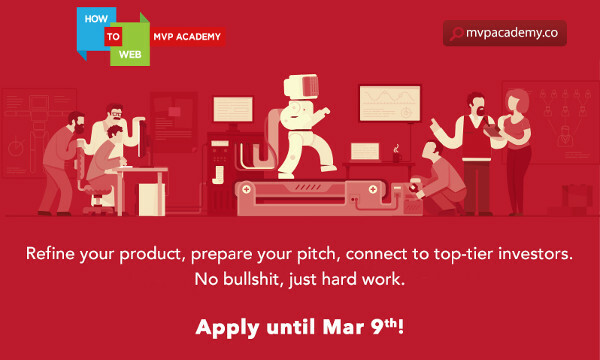 MVP Academy is looking for early stage startup that have at least a working prototype. The second edition of MVP Academy is taking place from March 23 to May 14 at TechHub Bucharest, and their equity-free program is designed to help you take your product to the next level and build connections with professionals, entrepreneurs, investors, accelerators and early stage investment funds from Europe and beyond. The program consists of practical workshops, as well as mentoring and 1 on 1 coaching sessions that will help you find product market fit, and give you valuable feedback and strategic advice. You’ll get to perfect your pitch in the pitching practice and try out your communication skills at several networking opportunities at local, regional, and international level. Some of the mentors you will be working with are Mike Butcher (TechCrunch Editor), Paul Smith (Co-Founder & Director Ignite100, UK), Olaf Lausen (Chief of CEO Staff & Business Development Director Telekom Romania), Marc Wesselink (Selection & Alumni Manager Startupbootcamp Smart City & Living, The Netherlands) and Calum Cameron (Managing Director Startup Wise Guys, Estonia), but there’s a pretty long list for you to choose from. There are several criteria you have to meet to participate in the MVP Academy Class of 2015: you have to be a promising early stage tech startup, in existence for two years or less, that raised less than 50.000 EUR in external funding and has not been through an acceleration program with the current project. You should also have a working prototype, be fully committed to building your product, as well as available full time during the 7 weeks of the program. You have time to submit your application via F6S until Monday, March 9, and keep the evaluation criteria in mind while working on your application form. The shortlisted candidates will be contacted for an interview. Bogdan Iordache (Investment Manager 3TS Capital Partners & Board Member How to Web), Cosmin Ochișor (Business Development Manager hub:raum) and Alex Negrea (Co-Founder & CTO docTrackr) will make the final decision on who makes the cut.